Alan Turing is considered to be the father of modern computing and artificial intelligence. 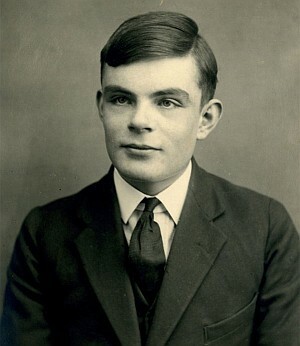 His concept of the Turing machine is still one of the most widely examined theories of computation. His early work was undertaken at King’s College, Cambridge where he was elected a Fellow in 1935 based on the strength of a dissertation on the central limit theorem. From 1936 to July 1938 he studied mathematical logic at Princeton University, in the world-leading research group led by Church. Turing obtained his Ph.D. in June 1938. His dissertation introduced the notion of relative computing, where Turing machines are augmented with so-called oracles, allowing a study of problems that cannot be solved by a Turing machine. From September 1938 Turing worked for the Government Code and Cypher School (GCCS) on the problem of the German Enigma machine; on 4th September 1939, the day after the UK declared war on Germany, Turing reported to Bletchley Park, the wartime station of GCCS. Within weeks of arriving, Turing had designed the bombe, named after the original Polish designed bomba kryptologiczna (or cryptologic bomb). The bombe, with an enhancement suggested by mathematician Gordon Welchman, became one of the primary tools, and the major automated one, used to attack Enigma-protected message traffic. After the Second World War Turing worked on the design of the ACE (Automatic Computing Engine) at the National Physical Laboratory. In 1948 he was appointed Reader in the Mathematics Department at Manchester. Soon afterwards he became Deputy Director of the Computing Laboratory at the University of Manchester, and worked on software for one of the earliest true computers - the Manchester Ferranti Mark 1. During this time he continued to do more abstract work, addressing the problem of artificial intelligence; he proposed an experiment now known as the Turing test, an attempt to define a standard for a machine to be called `intelligent‘. The idea was that a computer could be said to `think’ if it could fool an interrogator into believing that the conversation was with a human. In 1952 Alan Turing turned his attention to the then emerging field of morphogenesis, proposing a new hypothesis for pattern formation in biological systems. Tragically, Turing did not have time to further develop his ideas in this area; he died on the 7 June 1954, at the age of 41.